I attended the 27th Annual National Guild of Hypnotists Convention. I took a class with Rosemarie Schulman and was inspired by her knowledge of weight loss and weight management using hypnosis. Rosemarie Schulman RN, BA, CH, CI my Saturday, September 13th guest author at noon on Meet The Author w/ Heddy Keith. 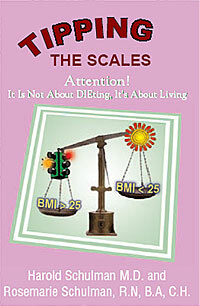 We will discuss her book Tipping the Scales. I feel it is extremely important for you to know as much as you can about the defining factors that distinguish overweight and obesity. If you are somebody who needs to lose weight, this program can help you accomplish that. If you are someone who has lost weight and is finding it difficult to keep it off, this program can help you deal with that in a positive way. If you are some-body who is not dealing with the medical profession on your weight loss journey, you need to be aware of the risks involved in going it alone. As a medical professional, I would advise everybody to seek medical advice before starting this or any other program. My goal with this program is to set you on a path that will bring you to the point where you can safely and permanently make a physical and mental change and finally accomplish your goals. I was brought up surrounded by medical professionals and have spent my life listening to good sound medical advice. I became a registered nurse and married a man who spent his life dedicated to helping others. Harold Schulman MD and I opened a medical practice dealing with medical issues concerning women. Fen/Phen was introduced to the public at this time and we were overwhelmed with patients asking for prescriptions. We decided to develop the program and monitor the results. It was very important to teach and encourage compliancy. The program was very successful and we talked other professionals into following our protocols. ← Can Hypnosis Make You Thin?